Mornings can be crazy enough without having to worry about anyone’s hair. Here are 10 of my go-to hair hacks for getting yourself and the kids ready and out the door on time. Stick to the easiness of a ponytail but with some added style. All you have to do is make a normal ponytail and then pull the end through the area between the elastic and the base of the head. This will take all the fuss out of doing your little girl’s hair in your rush to get out the door. See the idea here. There are just those mornings when you don’t have time to wash and dry your hair (sleep in? Who, me?). For those crazy mornings, use dry shampoo to wash your or your child’s hair. I prefer to make my own because the store bought products have damaging alcohols and chemicals. Learn how to make and apply dry shampoo from Style On Main. It’s taken years but I’ve finally learned to get along with my naturally curly hair. That wouldn’t be the case, however, if I hadn’t found some really cute and easy solutions. This messy bun look has been one of my favorite go-to dos. It’s as easy as tying a knot! Any little girl would look adorable with her hair like this for school. Source. I live nowhere near an ocean but love the beachy wave look. Lucky me that even without the salty ocean water, I can still achieve the body and curl I want. All I have to do is use sea salt spray. And I do… and I LOVE it! I used to buy a trusted store bought brand but decided to make my own to save some money. 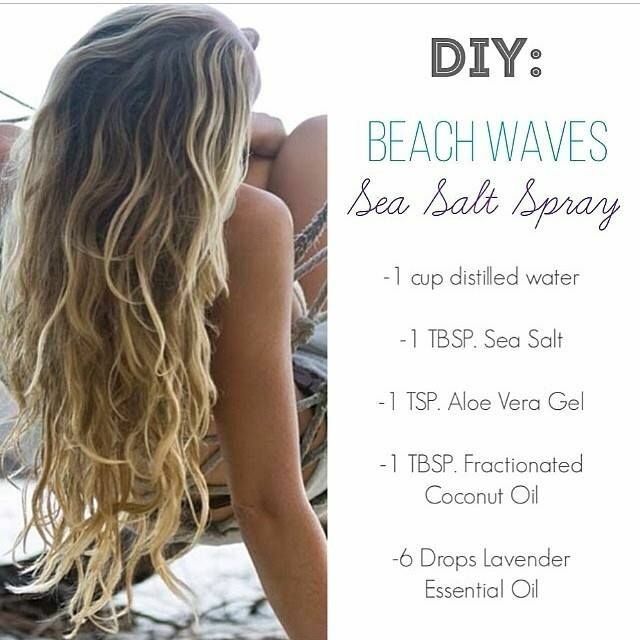 My favorite is this recipe because the oils keep moisture in my hair where the salt would otherwise pull it out. I especially love this look because not only is it cute, but I can apply the spray and style my hair in less than 3 minutes! I love this look! It’s perfect for days when you wake up with bed head but still want to wear your hair down. It has saved me on many-a-days. It’s even easier to do on someone else. No missing the school bus with this quick hair do. Take the pull-through ponytail one step further by finishing it off in a chignon. You or your daughter can pull this elegant look off in 5 minutes or less. All you have to do to achieve the look is start with the pull-through ponytail and then pin the ends up at the base of the head. Find the tutorial from Stylish Wife. Here’s a great idea for those with short hair. Just pull your wavy hair into a low ponytail in the back. Don’t worry if your side hairs aren’t long enough to stay in the elastic because the bandana will help keep the strays out of your face. You can find cute bandanas and head scarves at stores such as J. Crew and Madewell. How pretty is this look? I absolutely love the red hair but since I can’t really change that about myself (naturally, anyway), I can at least achieve the style. This is an especially easy style to pull off when you’re helping your little girl get ready for school. More info found here. Achieve this quick do by parting your hair in the middle and then braiding it all the way back on both sides starting from the part. Pull the rest of your hair into a ponytail and then braid your ponytail as well. Tie the larger braid into a bun and secure. Nothing more to it! Read more here. Another really fast and easy way to get a wavy look is to use a flat iron. It works especially great when hair isn’t freshly washed, so it’s perfect for rushed mornings trying to get to school on time. Flat irons are one of my favorite beauty tools of all time! Get the tutorial from The Goddess.